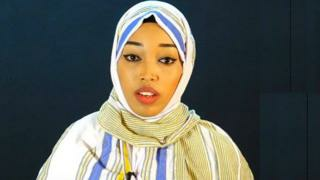 Image caption Poet Nacima Qorane was found guilty of bringing the state into contempt for backing Somaliland's reunification with Somalia. Pressure groups in Somaliland said Ms Qorane's basic human rights have been violated. Somaliland self-declared independence in 1991, but is not recognised internationally. In February 2018, the self-declared republic agreed to allow the United Arab Emirates (UAE) to set up a military base in the coastal port of Berbera, as part of the UAE's fight against Yemen's Houthi rebels. The prosecution said that she had labelled the self-declared republic of Somaliland a "region" and "insulted and defamed" its government. Somaliland's Human Rights Centre has asked the government of Somaliland to release Nacima Qorane and respect human rights. Its director, Guleid Ahmed Jama, told the BBC that it was "very concerned about the conviction and sentencing of Nacima Qorane". "Freedom of expression is enshrined and protected by the constitution of Somaliland. We urge the government of Somaliland to respect its own constitution," he said.